The Church of St. Lawrence stands as an impressive structure amidst a garden packed with palm trees. This neo-classical structure’s main façade is divided into three sections with its center flanked by two towers that each measure to about 21 meters high. The central section of the church’s main façade is embellished by a pediment with a protruding oval emblem in the middle. Its twin towers remains its most prominent and distinct feature as one was once a minister prison while the other was a superior Chinese tile roof. The streets that surround the church retain a pavement of stones as well as the green street balusters that have remained the same since more than a hundred years ago. Real stones were used on its walls. There are two ways to reach the church, one is from its rear or the other is by use of an impressive staircase and ornamental gate that provide for its dignified appearance. This flight of stone stairs still stands in front of the church, which has had its share of historical significance. During the olden days, families of Portuguese sailors used to stand on these very stairs that face the coast to pray for the safe return of their loved ones. This spot can also give visitors an idea of how many intensive urbanization efforts and reclamations projects Macau has undergone. The church is lavishly decorated with a beautiful turquoise wooden ceiling, gold and white ornamented pillars with sophisticated woodwork and lavishing chandeliers. Its ground plan measures 37 meters by 29 meters and takes the shape of a Latin cross. The shorter arms of the building make up two interior chapels while the longer extension makes up the main nave where the main altar is separated by a vaulted arch. The high altar contains a pleasant figure of St. Lawrence in a gorgeous vestment. Above St. Lawrence is a crown held by a cherub while behind it is a stained glass window with a dove of peace. All these together create an elegant church interior that heightens its overall pleasant ambiance. The Church is located along the Avenue of Sao Lorenzo and nearby lies the A Ma Temple, which is a structure dedicated to the seafarer goddess. 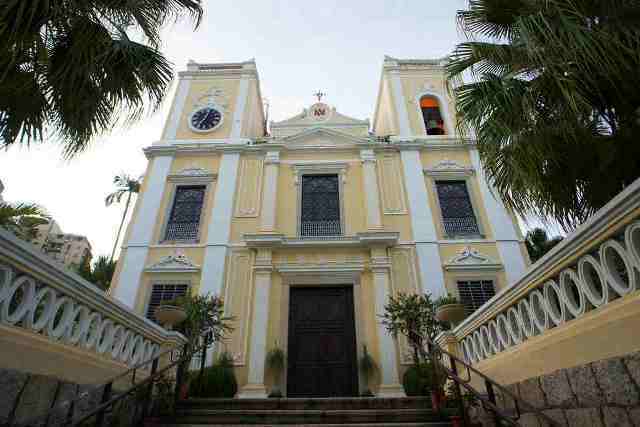 Today, the St. Lawrence Church has been regarded as being the most fashionable church in Macau because of its striking façade and exquisite interiors. Despite being over centuries old, this church has proved to stand the test of time as it continues to be marveled at because of its stunning appearance.